I’ve decided to do a re-release of my “How Were You Born?” T-shirt. Mainly to solve the confusion some people have over the Lady Gaga pic being either David Bowie or Harry Potter and to ease the pain of the internet grammar police (How vs Why). A few people at work had commented about the lightning bolt when I showed it to them, but it was too late to make the change as I’d already submitted it to Threadless. I hastily made the design and put it online without really mulling over it. Of course I wasn’t expecting it to get the coverage it did. I think Rebecca Black might know what I’m talking about here. If something you do, ever makes it onto reddit you should be honoured even if some of the comments are negative! Bowie’s lightning bolt is much bigger, Harry Potter’s is tiny and not covering the eye. How about I get rid of the Gaga image altogether and replace it with Freddie Mercury and the Queen song ‘Born to Love You’? For the grammar watchdogs, I did think long and hard over the use of the word ‘why’ instead of ‘how’… ie. Why Were You Born? in the original design. ‘Why’ made perfect sense but the Gaga one threw off the use when read ‘Why Were you Born?’ ‘This Way’. For that one to read properly it had to be ‘How’, so I sacrificed the grammar sanctity of four other sentences for the sake of one! grrr. Now that Gaga is gone, please be thrilled that the design is now 100% grammar compliant. 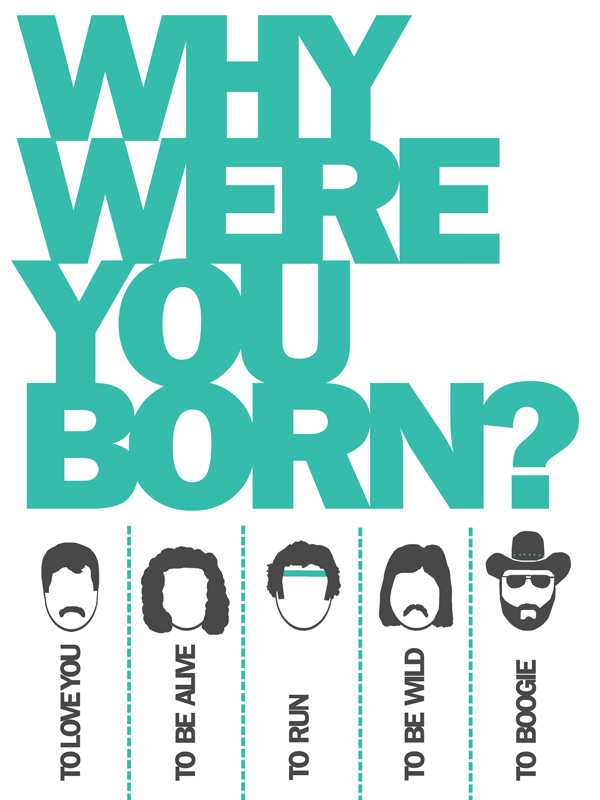 Head over to Redbubble and get yourself one of the re-release “Why Were You Born?” t-shirts now featuring Freddie Mercury! My T-Shirt Design Available to Purchase on Threadless – 2 weeks only! Street Art Poster Concept – How Were You Born?